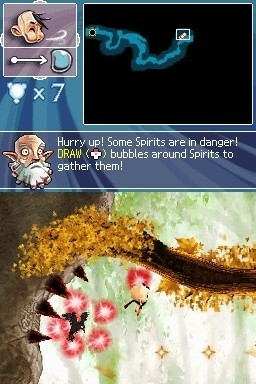 In the Toys 'R Us exclusive DS game, Soul Bubbles, you play as a small fellow with a giant scarf and great lungs. He has no name and is referred to only as the Spirit Herder by a senile and crazy-eyed mentor. This teacher guides you through a tutorial before you begin, showing you how to create and control the bubbles that protect the tiny spirits inside. Using the stylus, you maneuver your bubble-wrapped charges through a maze of spikes, wind and water currents, pitch-black opal mines and switches. There are eight nature-themed worlds to play through and each level has five sub-levels. Tribal art, including a nod to the American Indians of the Pacific Northwest accents the watercolor backgrounds. With the knowledge from your guide and the occasional hint marker, you must assess each obstacle and find a working strategy. For example, smaller tunnels require you to cut the bubble into smaller pieces, and switches need a large bubble to activate them. On the downside you travel back and forth between large stretches of the level to find water for fire-based obstructions. This drawback makes some of the gameplay a chore. As you make your way into the darkness, know that enemies lurk inside each location. They are ready to steal your bubbles and kill the spirits inside. Most are easily defeated with a tap on the touch screen; however some of these villains require more thought. The flaming skull heads, for instance, pop your bubbles and burn your spirits, but you can create a bubble with water and douse their fire. Getting passed the bad guys is just half the battle. In each of the 40 levels you must locate three well-hidden Calabash. Calabash is difficult to find. Shaped like a gourd, they unlock the final level of play. Additionally, little lights called Star Dust lead you to the end of each course, and although the game tracks the amount you collect, there are no rewards for a perfect score. Playing through the game is fun and relaxing. The music fades in and out and doesn't cause any distraction to the action on the screen. The bubbles float like they should and they are fun to direct and control. There isn't much depth to the little Spirit Herder, but the challenging levels more than make up for the lack of storyline. Soul Bubbles will keep you engaged longer than the real thing and is definitely worth a look. What's Not: Not much depth or back story, some obstacles require too much backtracking, available only at Toys 'R Us.